This rare newspaper has a full printing of seventeen amendments to the Constitution approved by the House of Representatives on August 24. On May 4, 1789, two months into the first session of the First Congress, James Madison announced that he intended to propose amendments to guarantee basic civil rights. The absence of such language almost sunk the Constitution’s ratification. 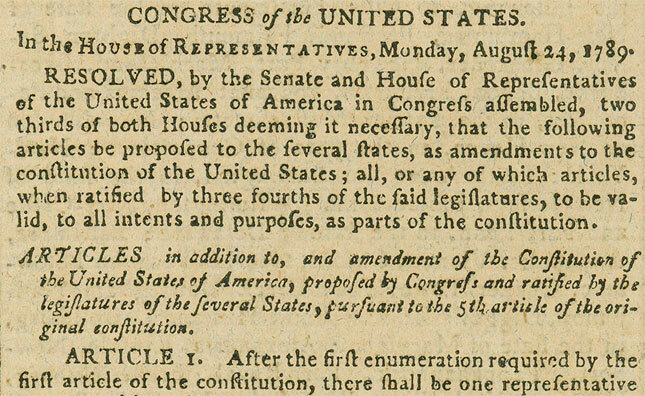 In the end, New York, Virginia, and several other states agreed to ratify only with the understanding that a Bill of Rights would be added by the First Congress. This issue includes the full text of the August 24 House resolution, which was then sent to the Senate for approval. The Senate began deliberating the next day, approving some articles and rejecting or altering others. Ultimately, ten of these amendments would be ratified by the states as the Bill of Rights. Read this remarkable draft, published 223 years ago today . . .